While all three schools within Farmington Central CUSD #265 have identified areas to improve within we are pleased to announce that all three schools (Farmington Central Elementary, Farmington Central Junior High, and Farmington Central High School) obtained COMMENDABLE status. SMART Goal: Farmington Central #265 will establish lines of two-way communication with the community by the conclusion of the 2018-2019 school year. SMART Goal: Farmington Central #265 will have a comprehensive one to one implementation plan by the conclusion of the 2018-2019 school year. 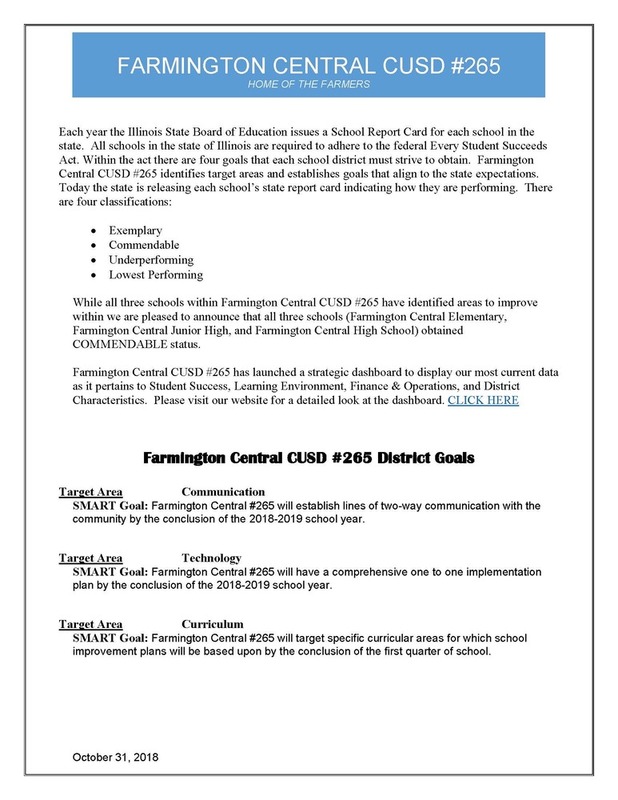 SMART Goal: Farmington Central #265 will target specific curricular areas for which school improvement plans will be based upon by the conclusion of the first quarter of school.